One of the Company’s greatest advantages is the high-grade nature of its deposits. 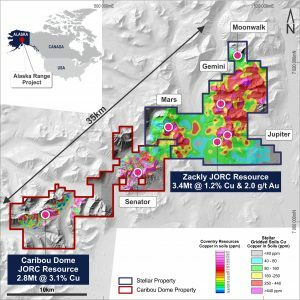 The JORC resource grade at Caribou Dome is 3.1% Cu and the JORC resource grade at Zackly is 1.2% Copper and 2.0g/t Gold, with 14g/t Silver. Both the Zackly and Caribou-Dome deposits remain open in all directions. No targets outside the existing resources have ever been drill-tested to date. Exploration and development programs are designed to initially bring the 100% owned Zackly Deposit and 80% controlled Caribou-Dome Deposit into early production whilst much larger new porphyry targets such as Senator (90%) and Mars (100%), are tested and if successful, advanced to resource/reserve status. PolarX has consolidated this entire region and has assembled an accomplished technical and commercial team in Australia with a proven record of delivering projects into production and a well-established technical and operational team in Alaska, USA. 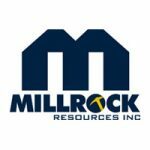 Shareholders, Mitchell River Group in Perth and Millrock Resources Inc. in Alaska each provide technical and on-ground operational assistance as required. PolarX’s integration allows complete holistic regional exploration and development of the consolidated Alaska Range Project for the first time in regional history. It immediately combines existing substantial high-grade resources and provides impressive exploration upside potential in one of the world’s best mining regions with road access and excellent nearby infrastructure. Alaska already hosts many of the world’s largest and highest grade gold and copper mines with similar geology to PolarX’s package. Members of the team have operated in Alaska for over 20 years and have been directly involved in 2 of more recent large discoveries at Pebble and at Donlin Creek.